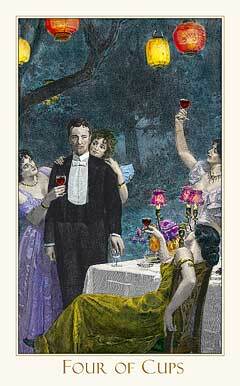 Today's Draw: Four of Cups from the Victorian Romantic. Does it feel like something's missing in your life? Is it something you can't quite pin down? What if the key to that feeling was found not in what's missing, but what's present in your life? We had this exact card just a few months ago. At that time, I challenged you to ask yourself some pretty tough questions about your life. If you're curious, the post was posted on 10/17/12, but dated 10/18. I won't repeat any of that here, as I have another take on the card. To begin with, this card from this deck is one of my favorite cards. The gentleman is surrounded by lovely ladies, he's at a party, yet something is missing. Sometimes this is a card indicating boredom, but more often than not it's about dissatisfaction. I'm sure all of us feel like "something's missing" at some time or another. We might even feel that way frequently. It can indicate a whole bunch of things covered in the post from last October. But one thing I think it also covers is our connection to spirit...or our connection to whatever we were before we came here. It's hard to be a human. We come here and we're disconnected from that part of us that is divine. Some believe that, as a race, we once knew, but forgot. But it's like there's something hardwired in us that knows we're so much greater than our everyday lives suggest...and we just can't seem to grasp it long enough to make it last. We see glimpses of it through "coincidence" and "miracles" and "spiritual epiphanies". But those are passing moments and we're left, once again, with our humanness. I was talking just today with someone about being human. I debate sometimes about whether we're here to just be human and have this experience with no pressure placed on it. Or whether we're here to raise ourselves up as humans so that one day the whole race may fuse with our collective divinity. Or some such notion. So maybe we're here to be schlumps. Or maybe we're here to find our divinity. Or maybe we're just here. Anyway, today when I saw this card, I thought the man had lost connection to his own divinity...and to the larger God around him. And the advice I had for him is this—gratitude. Look at all the abundance around him. But he can't be happy within it. Because he's not grateful for it. He's not grateful for his health, his good looks, his friends, his opportunities. If he were, it would be hard to stand in the midst of all of that missing something. He's focusing on what he doesn't have instead of what he does. We're all allowed moments of that. If we're in mourning over some loss, it's completely understandable. But there are times we feel this way when we have no good excuse. And the answer is gratitude. Our higher, divine selves understand the power of gratitude, but it's something we often forget as humans. So the next time you feel like something's missing in your life, consider that the only thing that's missing is your gratitude for all you do have.